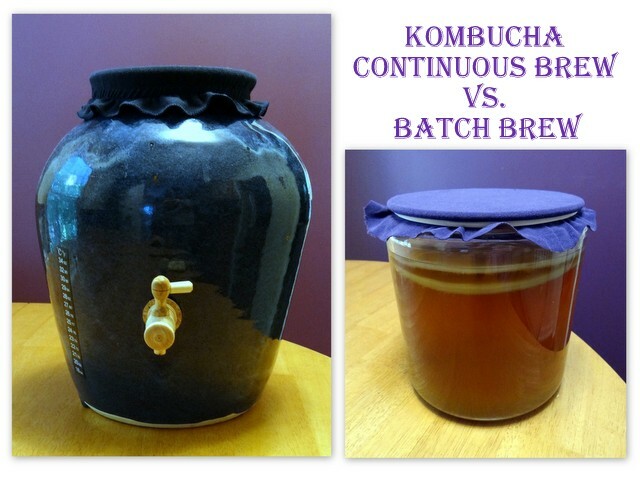 Continuous Brew Kombucha vs Batch Brew. Which is Better? Kombucha is a beloved beverage in the real food community, and my Kombucha Myths vs Truths and Tips and Troubleshooting articles are two of the most popular posts on this blog. Today, I'm adding to my kombucha series by exploring the hot topic: What's the best way to brew kombucha? Many people automatically say continuous brew – hands-down. I've been brewing kombucha for 3 years now, and I've done both the batch brew method and the continuous brew. Below, I'll share the pros and cons of each. Spoiler alert: One's not always better for everyone, but depending on your circumstances, one method might be better for you. It's inexpensive and easy to get started. If you are the only person in your household drinking kombucha, it makes plenty. A medicinal dose of kombucha is 4-8 ounces daily. It brews slowly, making it easy to get the perfect flavor for you. This is because it stays a similar flavor for a few days before going to the next level of sour. You're much less likely to accidentally brew kombucha vinegar. It can be a bit of a hassle. You need to set aside a block of time to bottle the finished batch and start a new one. Since you empty the jar and remove the SCOBY, you can't stop in the middle of this process. 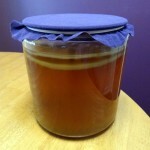 You also have to be careful that neither the SCOBY nor the tea gets contaminated during handling. If more than one person in your household is drinking kombucha, you will probably need to have more than one batch going at a time to keep up with demand. This doubles or triples the work. 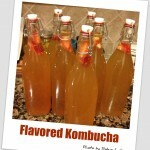 If you have a family, this is the easiest way to make a lot of kombucha quickly. It serves a crowd. It's easy to brew and maintain, because you simply add fresh sweet tea as you draw out the finished kombucha. There's no need to remove the SCOBY from the vessel. It's low-maintenance. You don't have to clean the vessel unless the spigot clogs up. And you only need to separate the SCOBY once every month or so. It brews fast. If you're someone who gets impatient waiting for your next batch of booch to brew, that doesn't happen here. That's because with batch brew, you have a 1:16 ratio of kombucha to sweet tea. (1 cup kombucha starter tea per gallon of sweet tea). That's a lot of tea to ferment, and that takes time. With continuous brew, at least 20% of the container is starter tea (and often a higher %). That means you have a minimum 1:5 ratio of kombucha to sweet tea. There's simply more kombucha to help with the fermentation. Additionally, continuous brew vessels usually produce larger SCOBYs, and they ferment faster as well. It provides stronger protection against mold. The kombucha starter tea helps protect against mold whether you're doing batch or continuous brew. But the fact that continuous brew has a higher ratio of starter tea means it provides a higher level of protection. It also offers more protection against invasion by outside bacteria/yeast. The vulnerable phase in any fermentation is the start of the process, before the ferment gets established. Continuous brew is a constant ferment that stays established after the initial setup. It converts sugar more quickly. At first I thought continuous brew would have a higher sugar content, especially if you drink and replenish one glass at a time, constantly adding sweet tea to the container. It turns out the opposite is true. In batch brewing, there's a “lag time” before the beneficial yeasts in the SCOBY and starter tea start converting the sugar. In continuous brew, yeasts are ready to go, and the kombucha gets sour much more quickly. It has a more diverse blend of beneficial acids and bacteria. This is because at each point in the brewing cycle, different acids and bacteria form. If you batch brew long enough, you can get an equally diverse blend, but many people prefer a slightly sweet kombucha and stop the brew early. With continuous brew, there is always long-brewed kombucha as part of the mix. Some of the containers are gorgeous. I love to be surrounded by beauty, and the continuous brew vessel in the photo above is a handmade stoneware vessel sold by Kombucha Kamp. It's more expensive to get started. Larger vessels cost more money. It brews fast. Yes, I listed this as a “pro” above, but it can also be a “con.” You need to keep track of the taste every day. It can go from a perfect sweet-sour flavor to vinegar-sour in just a day or two. If there aren't many people drinking kombucha in your house, you are quickly going to have more than you need, and that can be a temptation to overindulge on kombucha. 4-8 ounces is a medicinal dose, and drinking more than that can start to harm instead of benefit your health. Why? A couple of reasons: (1) Kombucha contains sugar, unless it's brewed to a full vinegar state that is usually undrinkable. 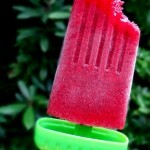 The typical sweet-sour taste we like averages 4 teaspoons of sugar per 8-ounce serving. (2) Kombucha contains caffeine. It's a much smaller amount than tea or coffee, but it adds up after numerous glasses. (3) We can overdo the probiotics. It's not true that more is always better. 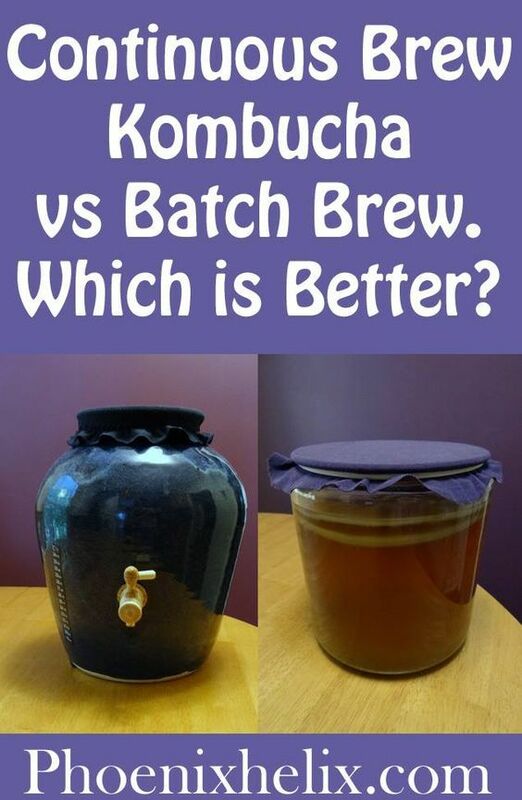 For details on this and more, read my article: Kombucha Myths vs Truths. Final Answer: Batch Brew or Continuous Brew? I think it depends on how many people are drinking kombucha in your household. If you're the only one, stick with batch brew. If there are two of you, you're on the cusp and either method can work. If more than two people are drinking kombucha regularly, continuous brew is worth the investment. The biggest jump forward in my kombucha brewing happened when I purchased a kombucha heater. I don't live in a tropical climate, and my house temperature is often in the 60's. That's not a healthy brewing temperature for kombucha, which prefers 72-85 degrees instead. Not only do you get a thin SCOBY and a slow ferment, sometimes the SCOBY goes to sleep and stops fermenting altogether (this happened to me). You also get the wrong type of bacteria and yeast at that temperature. I used a seedling mat for my first year, and it made brewing possible, but my SCOBYs were still weak. Then I invested in this kombucha heater from Kombucha Kamp. It cut my brewing time in half, and my SCOBYs became incredibly thick and healthy. My brew also became fizzier, richer in flavor, and I believe richer in probiotics. These heaters can wrap around batch vessels or continuous brewers equally well. Kombucha Kamp has lots of wonderful vessels for sale, made from a variety of different kombucha-friendly materials. 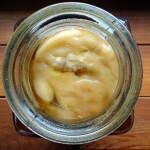 Fill 20% of your continuous brew vessel with unflavored fermented kombucha as starter tea, and add your SCOBY. Fill the rest of your vessel with sweet tea. To brew a gallon of sweet tea, boil 1 quart of filtered water in a stainless steel pan. Remove from heat and add 2 Tbsp. (or 6 teabags) of black, white or green tea. Don’t use any other types of tea. Black/white/green are all from the Camellia sinensis family, which is the preferred food for the kombucha SCOBY. Steep for 10 minutes and then remove the tea. Add 1 cup white sugar or evaporated cane juice, and stir until dissolved. Pour this sweet tea into a gallon pitcher. Fill the rest of the way with cold filtered water. Stir to blend and then test the temperature. It needs to be 85 degrees or lower before going onto the next step. Pour the sweet tea into the continuous brew vessel. Always leave a few inches of breathing room at the top, and cover with a tightly woven cloth. Don't use cheesecloth – it's too porous and flies can get in. Set it in a good location. You want the temperature to be between 72-85 degrees, out of direct sunlight, with good air flow (not in a cupboard). Use a kombucha heater, as needed. Start tasting your kombucha in a few days. Continuous brew kombucha ferments faster than batch brew. When it reaches the preferred level of sour-sweet for you, you can drain the fermented kombucha into bottles or mason jars to drink. You have two choices from here. You can drain a full gallon of kombucha at a time and then repeat the steps above. Or you can drain 1 glass at a time and just replace 1 glass of sweet tea as you drink the kombucha. If you do the latter, it’s easiest to keep a gallon of sweet tea in the fridge, for easy replenishing of the continuous brew. Always leave at least 20% of the fermented batch in the vessel, as starter tea for the ongoing brew. When you add sweet tea to the continuous brew vessel, it’s fine to pour it right on top of the SCOBY which may sink during this process but always rises to the top again. There is no need to stir the new tea mixture with the amount left from the previous batch; the fermentation process will blend it for you. You only need to clean your vessel if the spigot becomes clogged with yeast particles (maybe once or twice a year). For a quick clean, just drain it below the spigot, remove the spigot to clean it, reinsert and pour fresh sweet tea over the top. If you want to clean the whole vessel, set aside the SCOBY and enough starter tea for the next batch. Bottle the rest of the brewed kombucha. Clean the container using white vinegar and warm water. Start a new continuous brew following the instructions above. A number of people asked where they could buy quality kombucha supplies. Not everyone has a friend to lend them a SCOBY and tutor them through the process. So, I decided to become an affiliate of Kombucha Kamp. Hannah Crum has been brewing kombucha for over a decade and sells everything from quality SCOBYs to continuous brew systems. Whatever you need, she's got you covered, and she even offers a money-back guarantee.